For ages now share markets have been most discussed and coveted Investment Avenue for Indians. But why is it that more people fail with market investments and advice against it? It is because they make these common mistakes while investing in share markets. First thing to keep in mind is that there is no such thing as timing the markets. Markets these days do not follow a trend that a common investor can grasp or understand. Broadly yes, you can say that due a certain political or international event the markets may swing up or down, but apart from that one cannot be sure of how much and when the markets will rise and fall. There will be ‘predictions’, ‘projections’, ‘analysis’ and what not but still you as a common investor should not think of ‘timing’ the markets. Instead if you want to start investing, start small, go for a fundamentally strong company that has performed consistently well in the markets for a long term and invest in it and then take it from there. If you receive tips and blindly put your money in it, be prepared for some rude shocks down the road. Yes, you may gain at some point but following tips can be disastrous and there are more cases of people losing money than gaining by following tips. As mentioned before, study the trend of the company and its foundation along with its performance on the market even when there was a down trend. If the slide is lesser than most other companies or the performance consistent, then you can invest in their shares. Worst possible mistake to be made for any investment and the most catastrophic mistake to invest in shares, is borrowing money to invest. Any investment advisor, financial planner will tell you that borrowing for investment is the worst thing to do. The returns you get will be negated by the interest you have to pay on your borrowings and in case you incur even a slight loss that will result in you bearing a dual loss, which is: interest on the borrowings + repaying principal amount + bearing the loss on investment. I have seen people personally falling in this trap and going deeper. A colleague once followed a tip from his friend and since he did not have ‘substantial’ amount of cash, he took a personal loan (one of the most expensive loans), and invested in the ‘tip’ he received. The markets crashed, he lost quite a bit and then had to borrow from a relative to repay the personal loan and bear the loss, thus going in a spiraling debt trap. Invest with what you have and slowly increase your investments. Chances are you may have made good profits and since equity is known to give high returns when the markets are good, you may stand to gain a decent amount of returns on investment. If you have been fortunate to gain on the markets by making some random investments, it is great for you. However, do not think that just on that basis you know it all. Share markets are complex and while nothing is impossible, understanding the markets will take considerable amount of time, knowledge, dedication and even then they will remain unpredictable. Biggest of market Gurus and Financial Analysts who appear in slick suits on your television daily giving their ‘expert opinions’ have fallen flat on their faces in the current market scenarios. So don’t get overconfident and think you know it all. Stick to the basics and invest systematically. If you have been investing in shares for a long time, you probably know that ultimately prices average out and you may be able to get decent returns on your investment in direct equity. 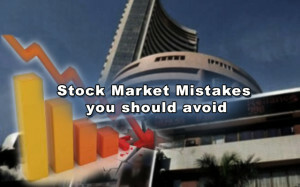 However, this can result in holding onto to dud shares; a common mistake while investing in stock markets. A practical example is of a famous Indian company that came up with an IPO for its foray into the power sector and it opened at about Rs. 400 in 2008, and a lot of people bought the shares at that price as the company was ‘too big to fail’ and in the long run it was sure to give great returns. However, today after almost 5 years that share is languishing at Rs. 65- 70. In such cases the averaging will not work out. It is a good idea to book your loss and get rid of such duds that have not risen even after a long time or else it keeps eating away the profits of your investment portfolio. Equity is the best asset class to invest in, which will give you inflation beating returns in the “LONG RUN”. Remember this statement. LONG RUN being the keyword. Short term gains may come once in a while but chances of you losing out is also higher. As mentioned before, if you are a common investor, whose primary profession is not shares trading or dealing in stock markets, look for the long term. Short term trading and speculation should be left for the ‘experts’ or full time share traders and brokers and investment big fishes. Long term investment will give you decent returns and hence the investment mistake of thinking short term should be avoided at all costs. Just like thinking short term is a stock market investment mistake, being impatient is another investment blunder. If you invested today and tomorrow the market crashed, don’t think of liquidating it. Be patient. Things will work in the long run. If the company you invested in is fundamentally good and has a proven consistent record in the past, chances are the prices will improve and you will get good returns along the way. Be patient. Remember Investments are not 100 meters sprint races, they are marathons. Don’t panic. Markets will fall, markets will rise, markets will stabilize, and they will correct themselves every now and then. This happens and will happen, so stay invested, if the shares you hold are fundamentally good and the proven over the past, you will get good returns. Don’t panic and break your investment habit. Remember the so-called experts and market Guru’s appearing on your screens are also humans and they do not run the markets, however influential people they may be. Their predictions and assumptions and analysis may go wrong. As mentioned before, markets are complex and are affected by a lot of domestic and foreign factors which at some point are beyond anyone’s control. So do your own research and don’t blindly follow what your favourite business TV channel told you. If you feel a share is attractive to buy just because it is priced lower and will hence rise in price over the years, then this is a BIG mistake. The share can be low due to a lot of factors and may also be a case where the share has fallen steeply from a higher price and is the actual valuation and won’t gain much. Do not make this mistake while investing in shares to just go for a share just because it is priced lower. Similarly, do not think that just because the share is priced higher it will not gain much. Again it all depends on the performance, market trend and past record and fundamentals of the company. Just like you ‘shouldn’t judge a book by the cover’, you shouldn’t be judging a share based on its price. Last but not the least, do not put all the money you have for investment into shares. Diversify. Keep a balanced portfolio with a good mix of equity and debt as well as other types of investment avenues like Mutual Funds, PPF, FD, Recurring Deposits etc. If markets fall, you will loose all you have if you do not diversify. In worst scenarios when markets are bad your debt investments will at least give you some cushion. So DO NOT make this stock market investment mistake of putting all your funds into the stock markets hoping they will give fantastic returns. Don’t be greedy. Stock market is not a bad place to invest as a lot of you may think. Nor is it a place only for a selected few. It is an investment avenue just like any other, however you should be more careful and prepared to face some sort of loss and stick to your investments in a regular systematic way and avoid these mistakes for investing in shares. Also if you feel that still direct equity investment is not for you, worry not as you can still get equity investment going by way of the relatively safer mutual fund route. You can refer our guide to understanding mutual funds here and how to invest in mutual funds here for more details. However if you feel comfortable you can always get started in Share Market Investments by referring to our guide here. THANKS FOR THE SUGGESTIONS. I AM A BEGGINER. WILL FOLLOW THE TIPS OF THIS GUIDE. You are doing an awesome job….keep doing it…. One question from my side…. If I buy a share of a company for about 500 today,the next day if it raises to 600/share ….can I sell it? the next day…..or is there any time limit to sell shares which we buy? There is no specific time limit for which you have to hold the shares. great .. thanks for the tips . really help full . Tips and suggestions are very very practical and help- full for the beginners. Your article is well written with honest and balanced approach. Thanks. So glad you liked it. Readers like you keep encouraging to keep going. Thanks! you have got the power of writing concisely and to the point. thnks a ton. suggestion..plz pic some investing terminologies like market cap,returns,dividends,etc etc and explain in brief ,,this would help us more. if u have any other such blogs,app anything plz mail me. Point noted. Will surely do a short post of something to explain the terminologies. That’s a nice suggestion. This is the only blog I have so far… if there is anything new coming up, will surely let you know. Thanks for the appreciation. Very nice tips….useful for everyone …please write more tips for share brokerage.. Thanks for the appreciation. Will keep adding to it. Your posts are really helpful and there’s a sense of authenticity in them. Though it was about avoiding the mistakes, still it came as a positive post and I’m saying this with all the honesty that I’m feeling more confident than ever about investing after reading this post. I’m up for the ‘Marathon’. Keep the Good work up. Very much helpful for beginners. Thank you. Sir I am fresher in this field. And your tips is very useful. But I have some question. Can you let me know of some books that can guide me through stock market investments? I am a fresher in this and planning to start investing for long term. I have heard like if i purchase share of Rs 100 after raising the Share price to Rs 105 That Last Rs 5 will be Rs 50 or Rs 500 of earning is that true? I didn’t quite get your question. If companies multiply profits of investors by 10 times then they will soon start making losses. The actual profit is the only profit that you will receive and not more… and definitely not multiplied by 10. Thanks for the information. It will help me alot in future. Please can you post all new updates or any other informational stuff on my email ID. so that I can be always be updated and learn the new things. Sir, I m a beginner and u knw no idea wat long term and short term investment actually mean. can u please brief me abt them? Trading should only be done if you are experienced enough to know the pros and cons of stock markets and understand the trends, or else it will lead to losses. Investing should always be for the long term, so if you wish you should invest a large part of your funds and try trading with a smaller portion. As far as traders are concerned, I am afraid I cannot recommend and personally, since that depends on city to city and how you individual experience was with them. However most of the demat account providers do help out in making trading as well as investing decisions. They also have relationship managers to solve your queries and guide you in your decision making process. You can contact them. Please answer some of my questions that worry me. I want to know that can I fall in debt if the share falls? ex- If I invest ₹5000 in share and if the share falls drastically then will I go in debt…like negative ₹5000 or more or will I just loose the money I invested? What is the minimum number of shares that I’ve to buy? 10, 20, 30? If the shares you invest in fall in prices, then you only loose the money, you do not fall in debt. No one will ask you for the money that is in the negative. If you invested Rs. 5000 and the shares price falls below, you just loose the money, and that also if you plan to sell it at those prices. The price of shares will never go in the negative, at the most it will go down by some percentages; high or low depends on the markets. You will be in debt only if you have borrowed that Rs. 5000 to invest in shares from someone, and you have to repay that. If it your own money, you will just loose it, and that too only if you sell. If you wait for the share prices to go up again and sell at that point, you can either break-even or maybe even gain. There is no minimum limit on shares you can buy. However at times there is a minimum value that you need to buy so if say a share is valued at Rs. 10/- and minimum value for you to execute an order is Rs. 500/- then you may have to buy 50 shares. But that varies from share to share and also in an IPO there is a minimum limit, not in the open markets. thank u very much sir got an idea about stock market,specally thanks for ur alerts about DO’s and Dont’s in stock market………. Glad to know the post helped you. It motivates to keep going when suchposts help visitors. Thanks for the encouragement. if possible den pls sir give me more info. on investing in share market . Thnx Sir… today i m beginner bt your advises and tips wil me make me expert one day Surely ! Your tips are seemingly helpful. thanks. Glad it helped…. it encourages to keep going and post useful posts.